We don't need any more IPCC reports on climate science. 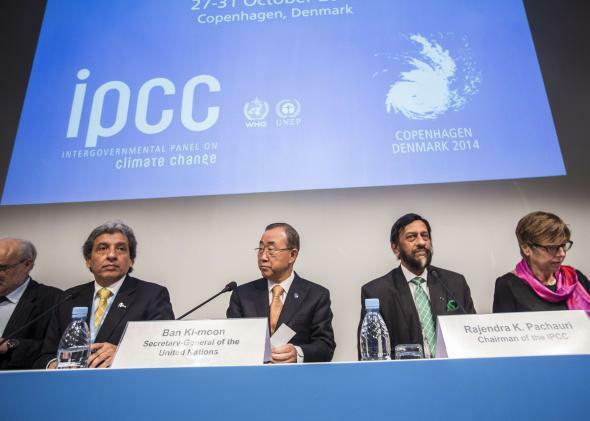 Peruvian environment minister Manuel Pulgar-Vidal, U.N. Secretary General Ban Ki-moon, IPCC Chairman Rajendra Pachauri, and IPCC secretary Renate Christ present the AR5 Synthesis Report in Copenhagen on Nov. 2, 2014. What for? On Sunday, the world’s best climate scientists were back at it, gathering in Copenhagen to deliver another report, the culmination of the most comprehensive study ever assembled on global warming. There’s no indication that this week’s report substantially changes the basics we knew back in 1990—though there have been huge advances over the past quarter-century in eliminating the remaining shreds of uncertainty in just how fast we’re screwing ourselves over. There is no lingering scientific uncertainty that should prevent an immediate “substantial and sustained” reduction in greenhouse gases by every country on Earth. Which countries reduce by what amounts should be our focus now, and that’s not a job for climate scientists. That’s a job for countries, communities, and individuals. Motivating action on climate change is a far trickier problem anyway, apparently, than understanding the inner-workings of humanity’s tampering with the Earth’s thermostat. If I had a time machine and could interview the scientists who wrote the 1990 report and ask them where they thought we’d be by now, I’d guess that not a single one of them would have expected we’d have waited this long to address the problem. The warning signs, implications, and solutions were nearly as clear 24 years ago as they are today. Scientists are by and large rational people. They’d likely have assumed that, given such clear and convincing scientific evidence, surely our leaders would have taken action on something as important as the fate of a livable planet, right? Wrong. Fast-forward to 2014. Despite polls showing a majority of swing-state voters are willing to support action on climate change, the issue is dead last in a ranking of topics that candidates are talking about in advance of Tuesday’s midterm elections. At this point, artists like these are at least as effective as scientists in motivating action on climate change. Just last month, as activists gathered by the hundreds of thousands in New York City to protest a U.N. summit on climate, a moving poem by a Marshall Islander was enough to bring world leaders to tears. The world’s best scientists have done the best they can. Now, the hard part begins: listening.